Every once and awhile an interesting design or product comes along that catches my eye at least twice. Any master of the culinary art has their preference on cooking utensil as well as an intimate knowledge of what doesn't work, what does work - and where to find what works. Many chefs tout the benefits of cooking with traditional cast iron pots and pans, but in modern days, especially for the majority of us "weekend chefs," finding a quality cast iron skillet can be difficult. Since most are made in remote countries, their quality may not be as keen as the wares some of us used decades ago. The finish of the cooking surface can be a tricky area because whatever you cook on it basically is "cooked" by that surface. 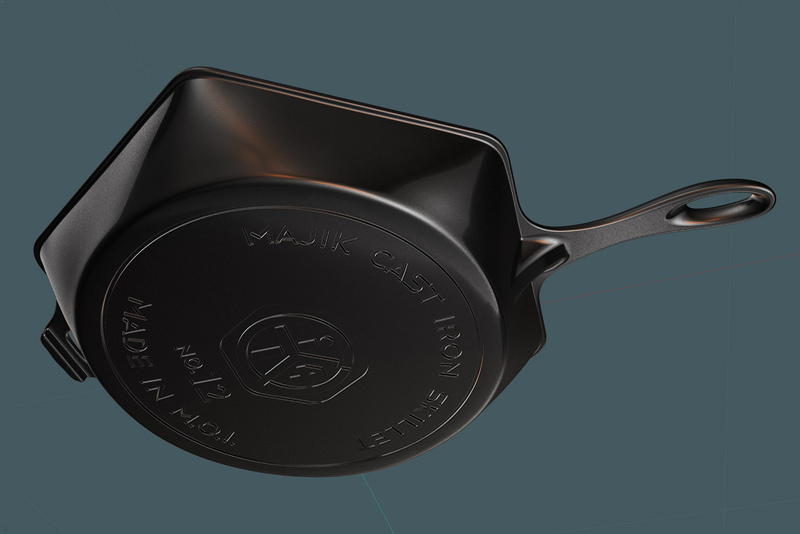 Enter the Kickstarter company known as the Finex Cast Iron Cookware co.
Mike Whitehead and others started this manufacturing project a few years ago to help answer the domestic need for a cast iron skillet of exceptional quality. 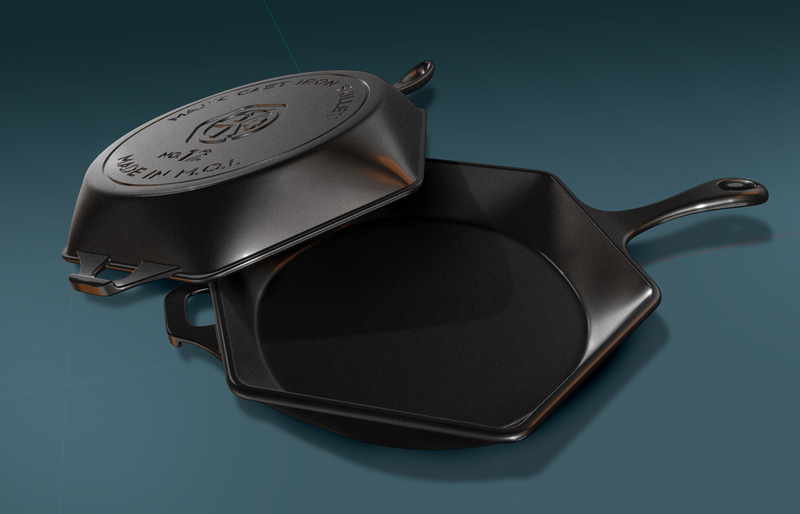 The skillets are in production now, and they're at least $200 US for the No. 12 size in production. 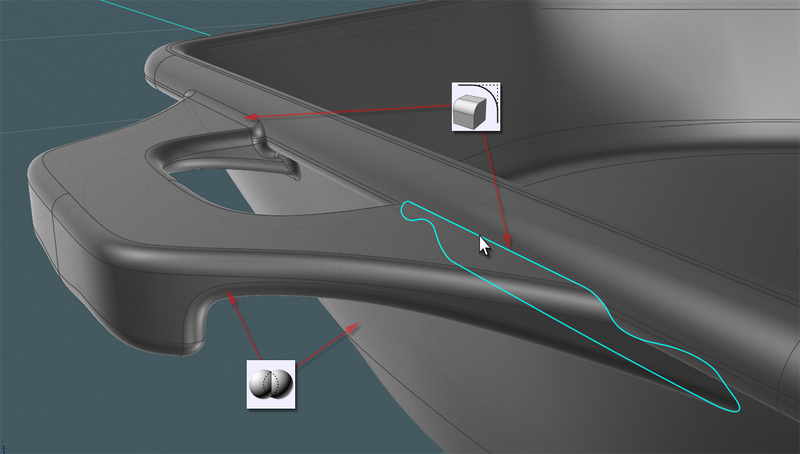 SolidWorks was used to model the Finex skillet, which was made into a hardened wax form to make sand moulds. 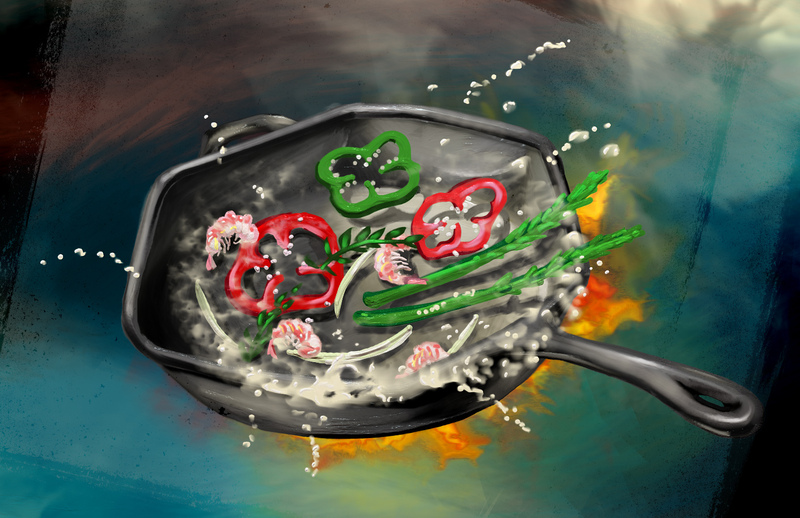 • A steel spring handle which nearly allows for skin contact even when the pan is very hot. • Oh, they just happen to guarantee it forever! My intent here was not to provide a tutorial on how to re-construct or de-engineer the Finex product, but as an homage to the elegance of such a simple object. 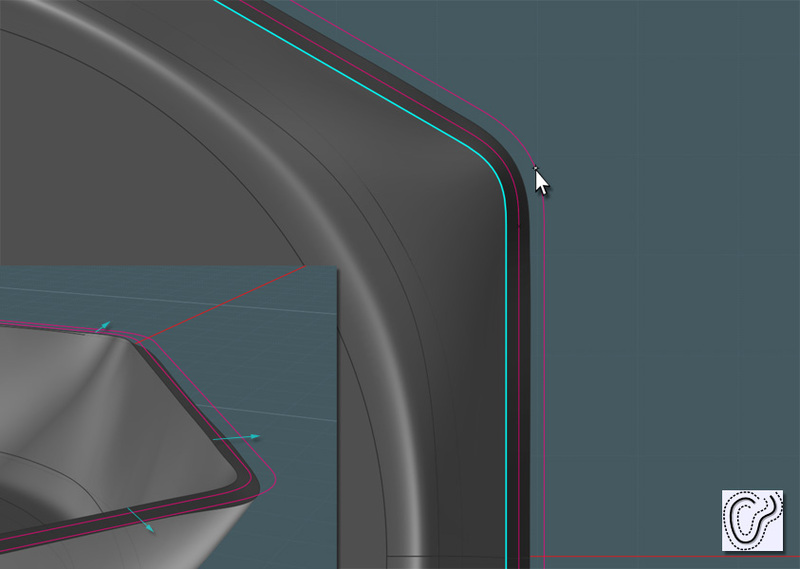 I'll be focusing on Moi3D's V3's newest Variable Fillet command. Keep in mind that the Fillet command is very finicky in the first place. 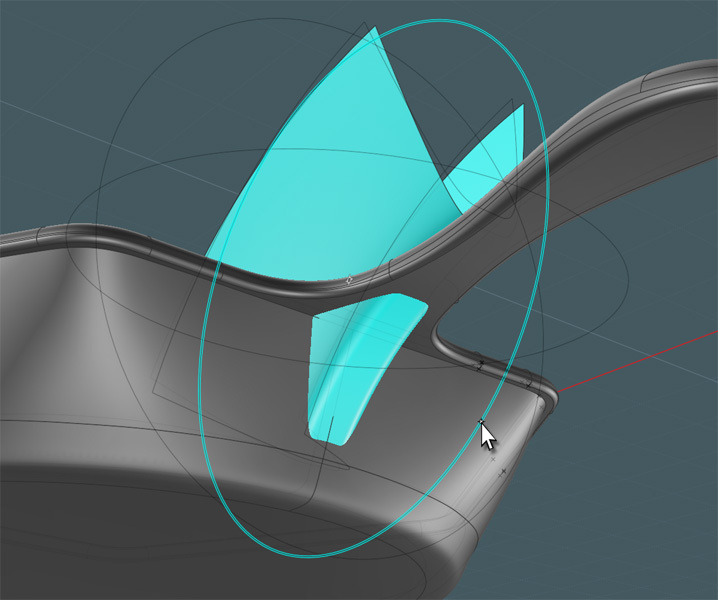 Fillet surfaces cannot seem to cross each other or overlap onto adjacent tangent surfaces - so you'll have to get a knack for using it. 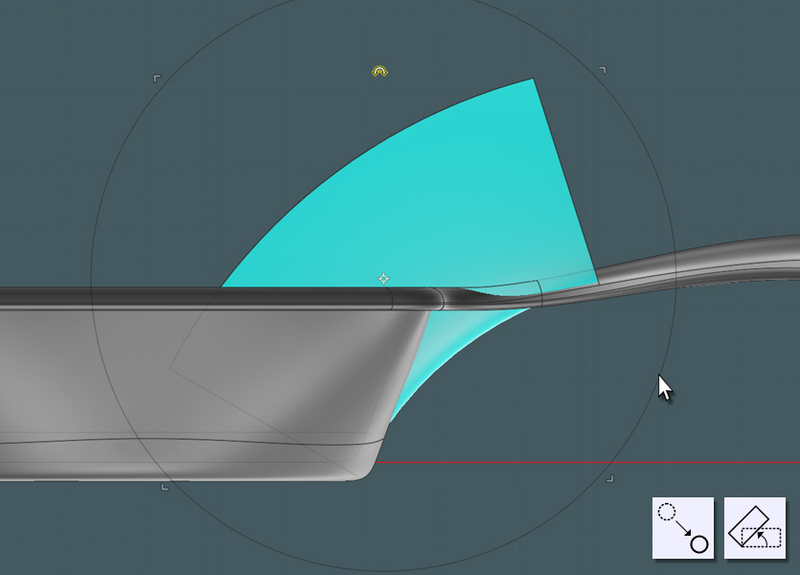 I can't guarantee that every step here will work on your Moi3D, so please glean what you can from it. First off, what is a "Number 12" skillet? Here, we'll make a circle that is 11 + 3/4 inches. 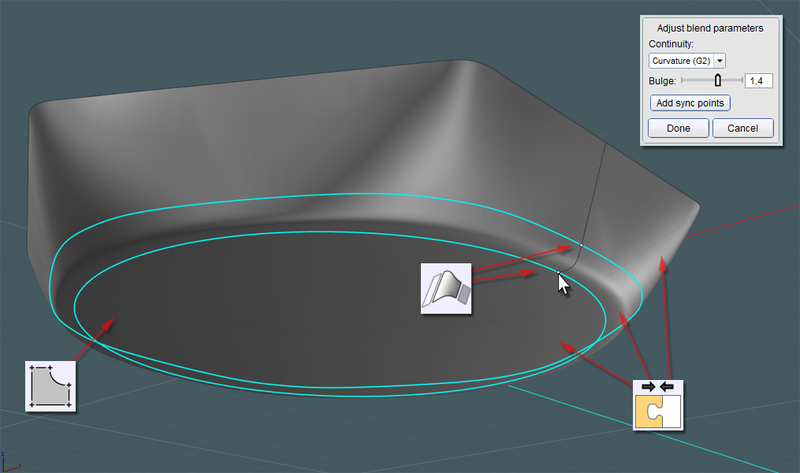 In Moi3D, you can click on the word "Radius" and it will toggle to "Diameter." Moi3D also excepts basic math entries. 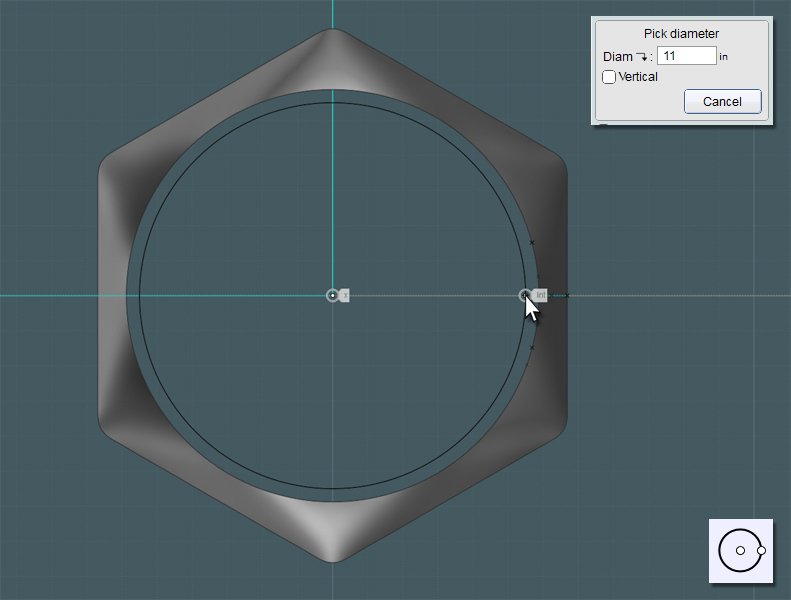 In my example, I am using a hexagonal shape instead of the octagonal Finex product. 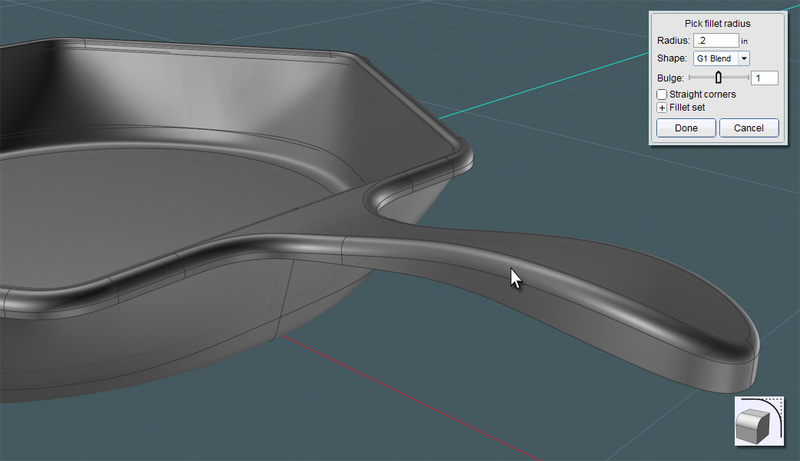 I'm using this shape to make a more interesting object... who wants a tutorial on a plain frying pan? Draw two six-sided polygons. 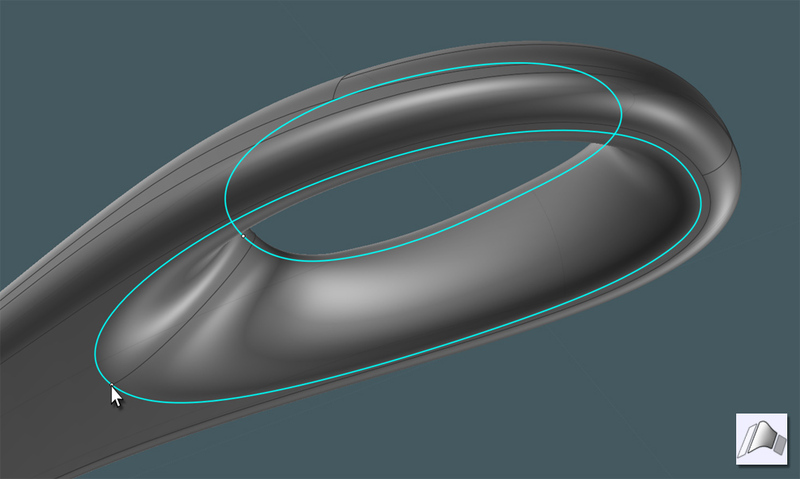 The diameter is not crucial, because of the unorthodox shape. 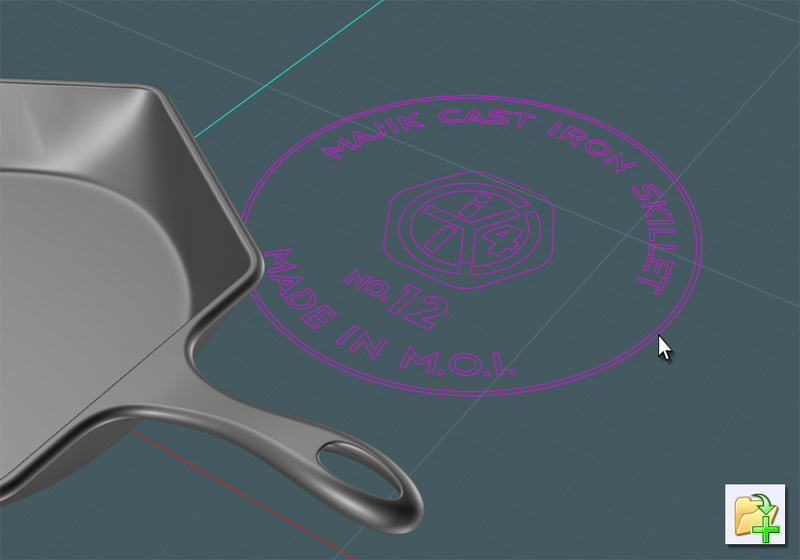 Move the outer shape up until it represents the depth of the skillet container. If you'll notice the orange line on the side. I'm using that as a general guide. You can also use 2D Scale to enlarge the objects to match. Not give a nice Fillet to the hexagons. The one on the top must be smaller, like maybe a half an inch, and the one in the middle should be very broad. The broad one will help match the hexagon to the bottom circle more fluidly. I found that a "G2" corner gave me a better subsequent Loft result then the "G1." 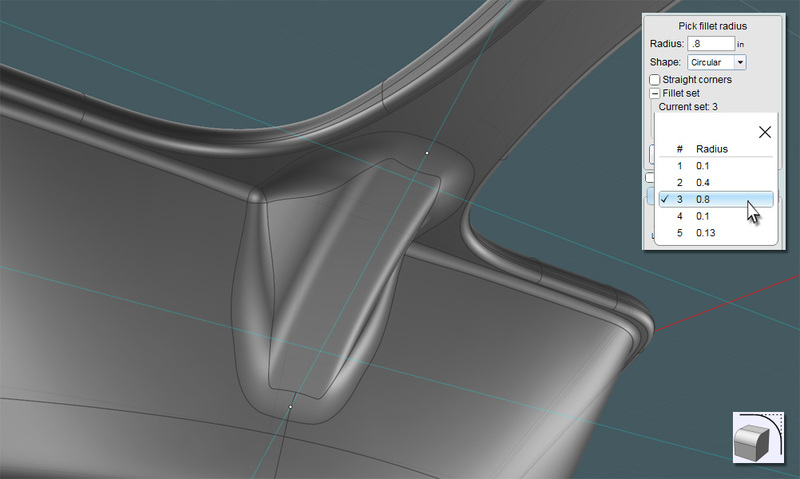 I applied a Fillet originally, but found that there was an inherit wobble around the perimeter of the round-over. 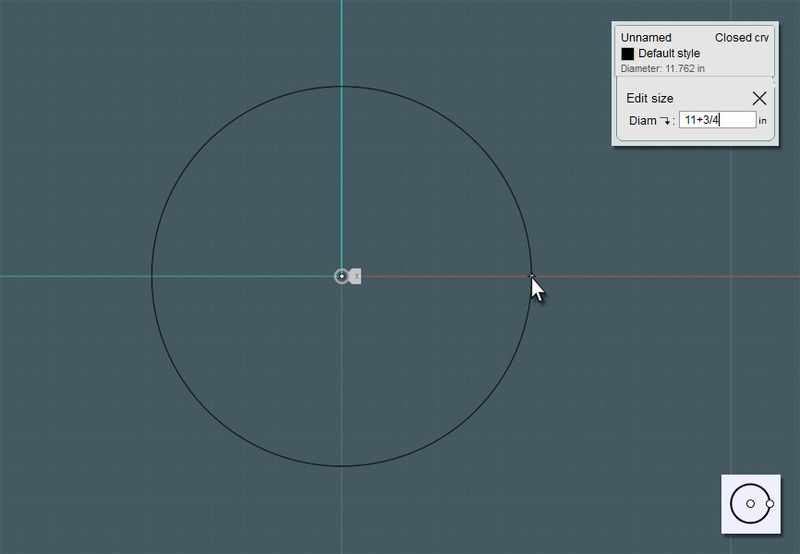 Take the circle and use the Planar command to make it a surface. So I found it was better to make a Blend from the Loft surface to a purely circular bottom. To better facilitate space by which to make a smooth Blend, cut off a small section of the bottom on the Loft surface. A "G2" Blend does a nice job of making the surface flow more naturally. 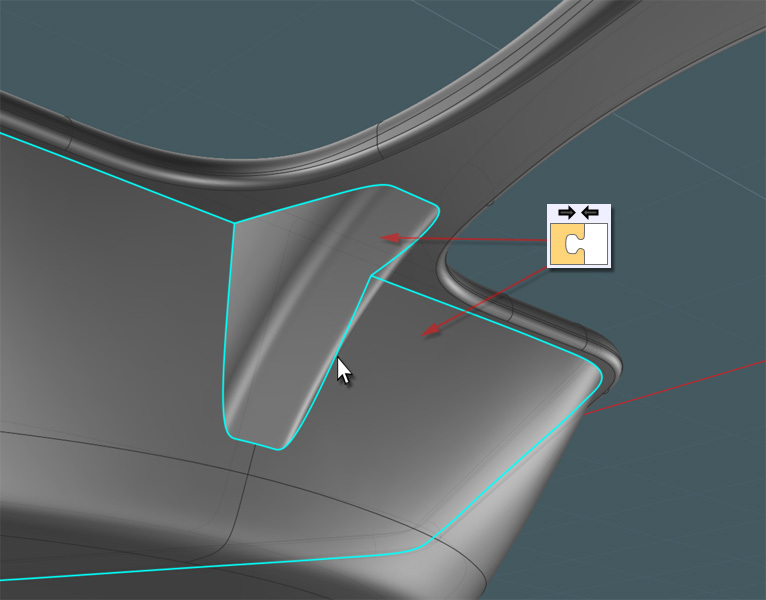 After Joining the Blend, Loft and Circle plane, use the Offset (Shell) command to give this object a 1/4 inch thickness. Hopefully you kept the Filleted hexagons from before. Here you'll need to form the rim or lip area on top of the skillet that straddles the outer edge of the pan's solid. 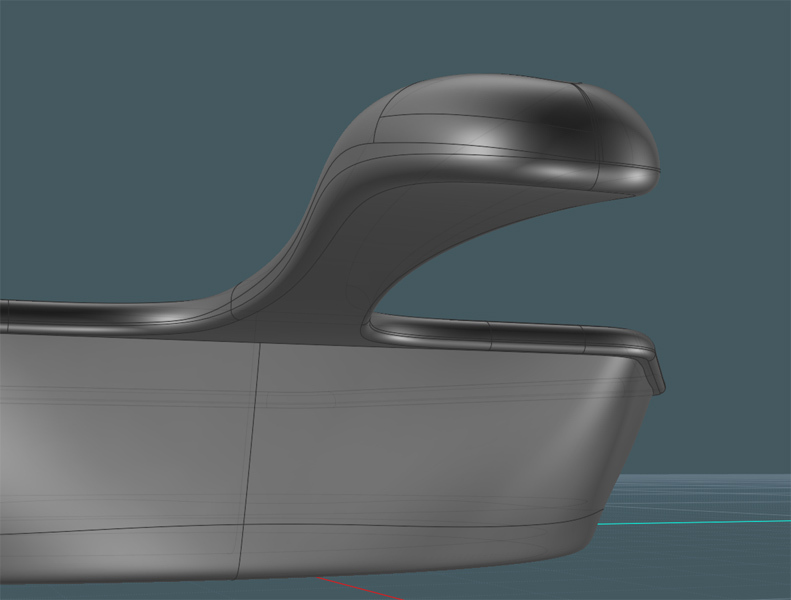 Note that the top of the Offset/Loft object is wobbly. Here, we'll make the handle. I made this one about an inch wide and seven inches from the pan's edge. 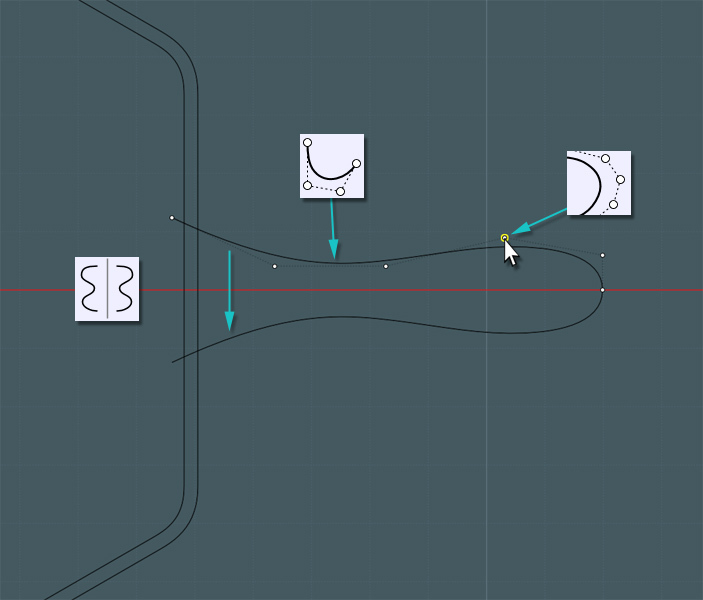 Use the Spline curve tool and Mirror (with history) to fine-tune your shape. Do this on the same plane (Z) as your pan edges. 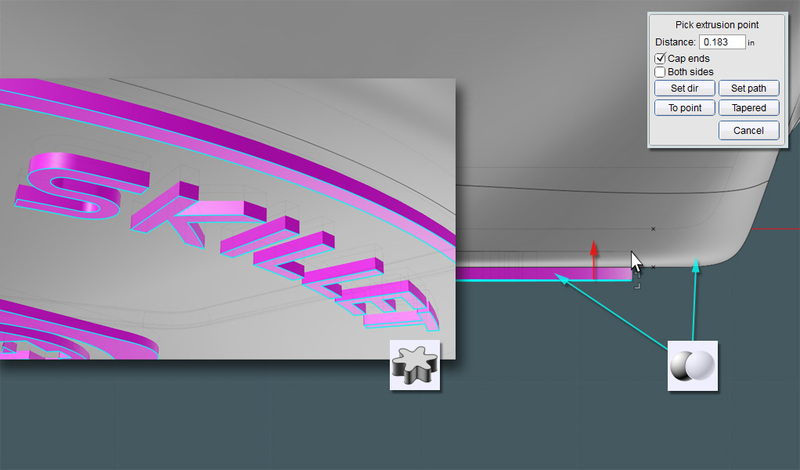 When done, cap the open end of the profile shape with a straight line and Join all together. 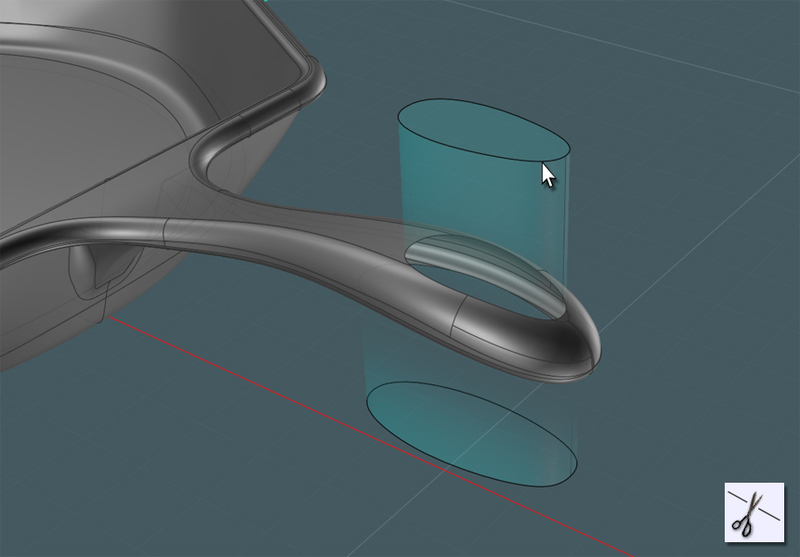 You can now Boolean Union the handle shape into the outer pan shape. Fillet the joining corners for a nice appearance. Go to a side view and create the associative profile shapes. 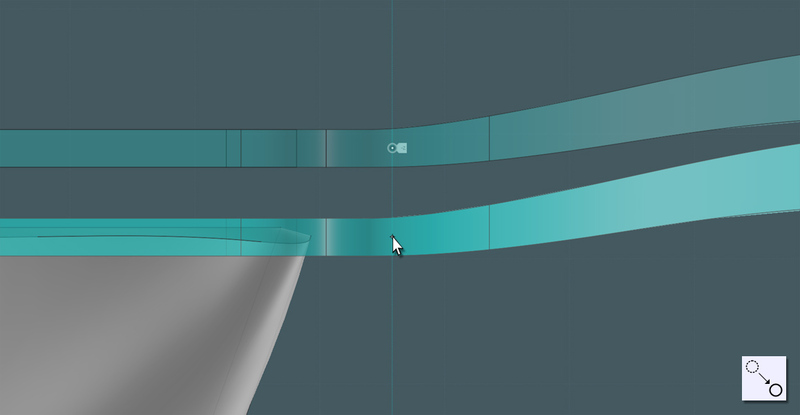 Use the Spline curves and make sure that a flat region occupies the region where the pan is. Cap the open regions when done, Join all. 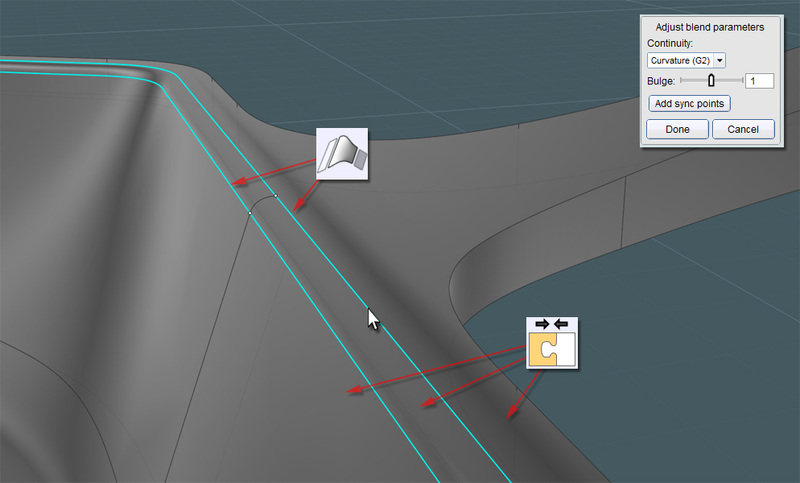 Make a Planar surface with both profiles. Surely, Boolean Intersect was supposed to give me some representative blending of the two profiles, but I could not get it to work. So we'll do it the old-fashioned way. 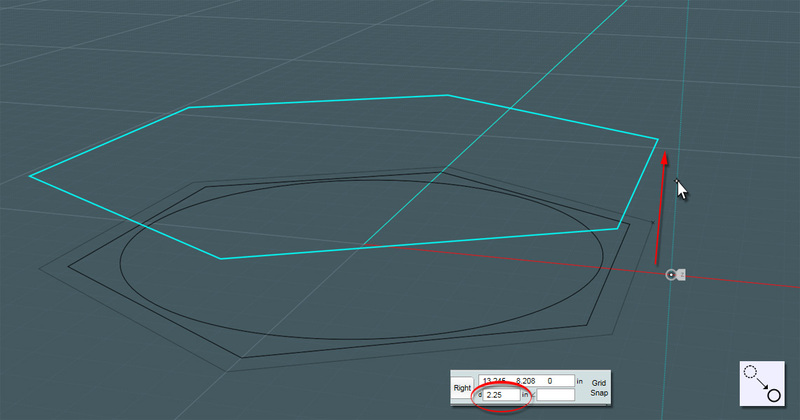 Now Boolean Intersect the two solids. Here, you can give them a nice iron color and change your Lighting Options to bring a more "metal work" feel to your model. 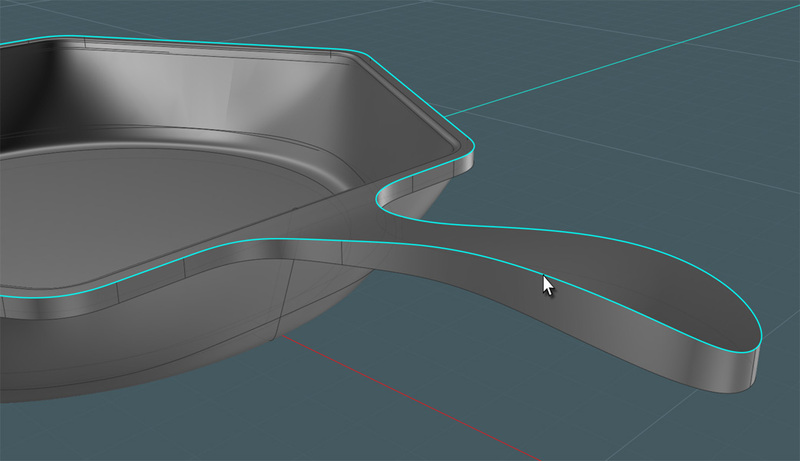 Move the new shape to encompass the wobbly lip-edge of the pan shape. 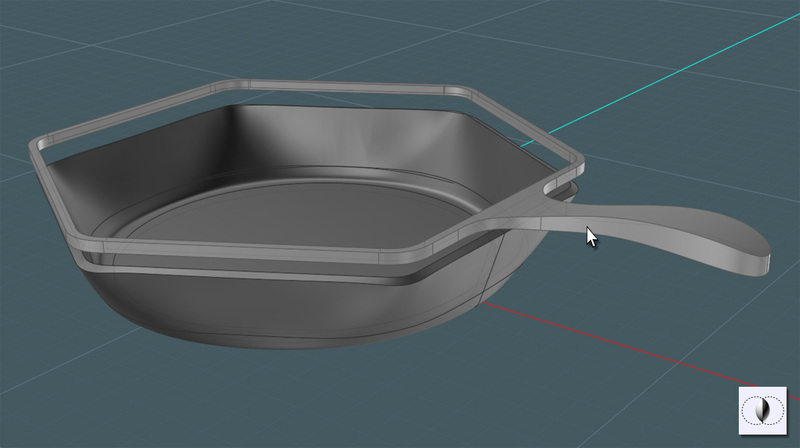 Boolean Union the pan and the handle shape together. I placed the lip in an off-center position on purpose. There is now a sharp recess formed. Delete this. Smooth it over with a new "G2" Blend surface, and Join everything. 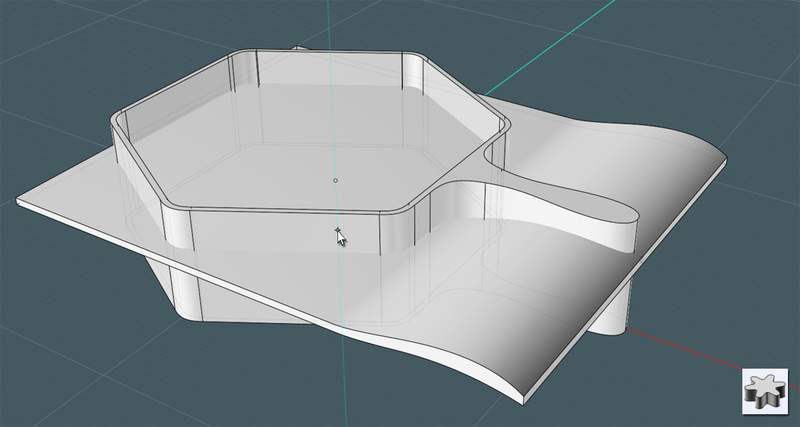 LET'S HAVE FUN WITH MOI3D's NEW VARIABLE FILLETS! 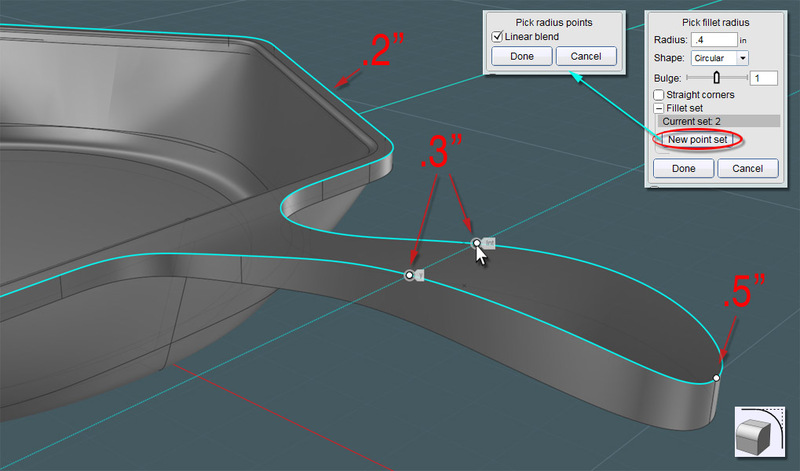 Select the top perimeter surface edges. Start off with a nice radius, and leave yourself a little space on the bottom of the lip. I can't really guarantee details here because Fillets are trial-and-mostly-error animals. 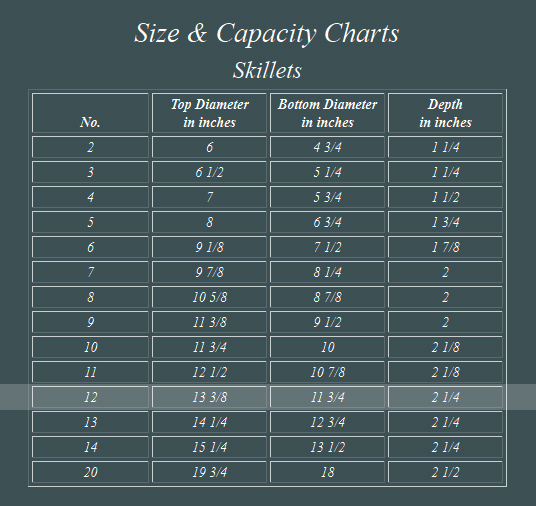 Create a smaller bottom Fillet. Notice how it wraps nicely around the whole skillet body. Okay... the area where the handle meets the pan is rather sterile. 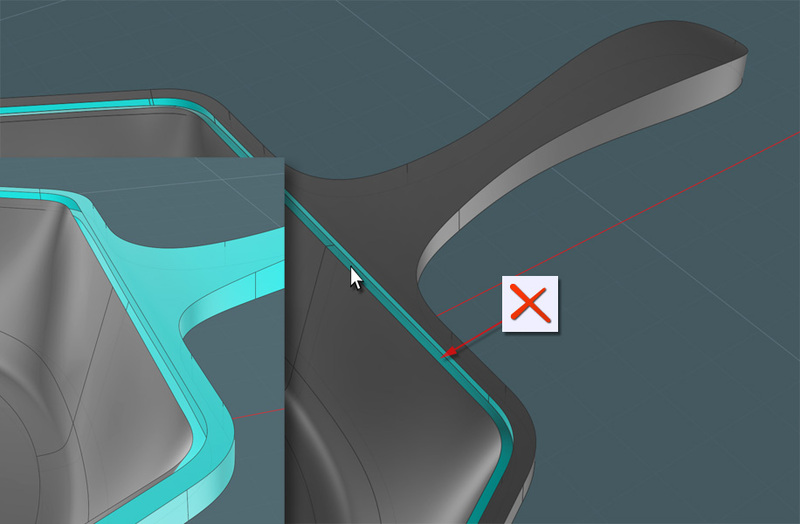 Do you want to not have an ugly seam present if you Sweep any shape using multiple Joined curves? Just delete the adjoining control point! No explanation here... just Sweep the profile along a subtle Arc. 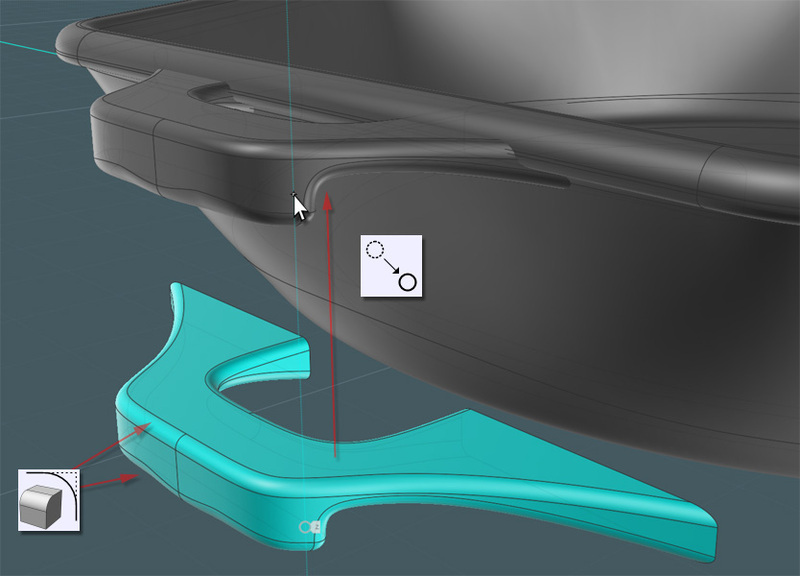 In the side view, you can laterally adjust the position and angle of the surface. 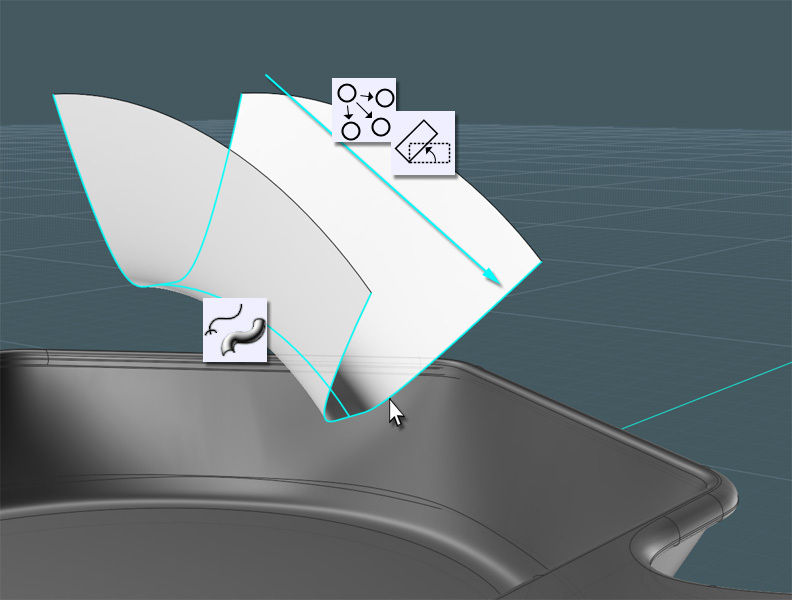 If you happen to select the rotation icon when the handlebars are active, if you go to Perspective View, you can play with these global rotation circles! Adjust, giving you enough room for Fillets. Here's a tricky part: When Michael releases the new selective-face Boolean option, this will be easier. I found that not only did I have to use Boolean Merge, but I had to do to pre and post cutting and pasting to get what I needed. Once you have your shapes cut, they will not Join until you remove the back-faces. OH! You have to love the new Fillet! The result was hard to figure out, and the result is kinda wonky, but I am happy with the result. Let's make an apposing utility handle. This feature allows you to hand the skillet from the other side and also facilitates in helping you lift the skillet with both hands if there's a lot of food inside. 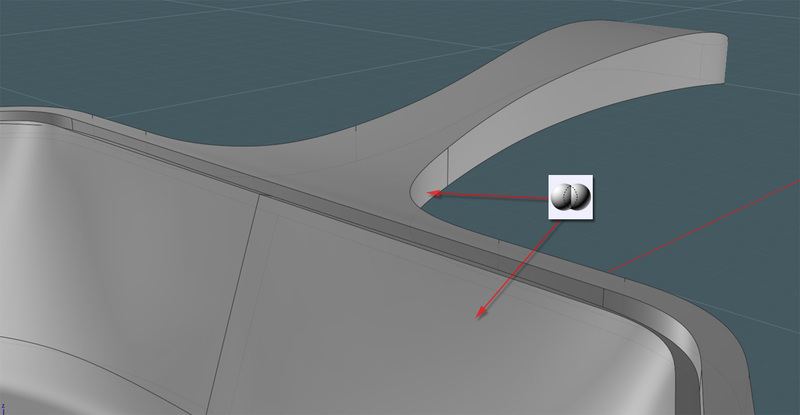 Make a profile as shown and trim some of the bottom out to create an interesting flange. Don't Fillet the back parts so that you can better affix it to the skillet. 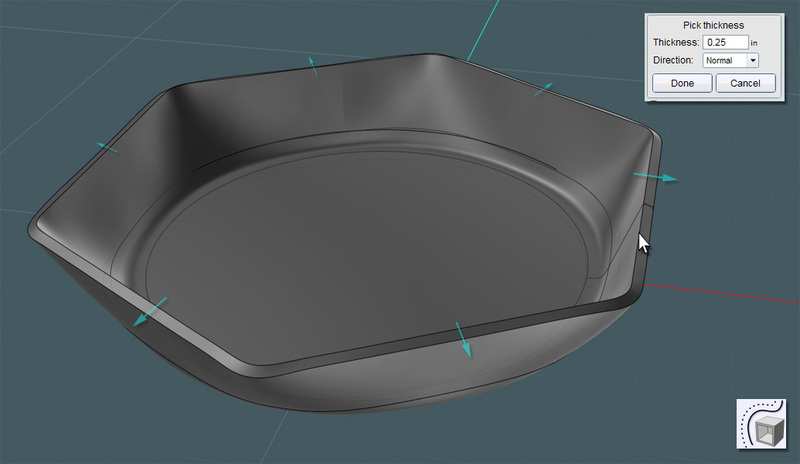 Move the handle near the top of the skillet... since this item is sand-casted, you cannot really have any odd objects jutting out on the side without some difficulty in manufacturing... but what do I know? Notice my interesting dimples in the handle? Boolean Union the handle to the skillet body and (try) to Fillet a nice transition. 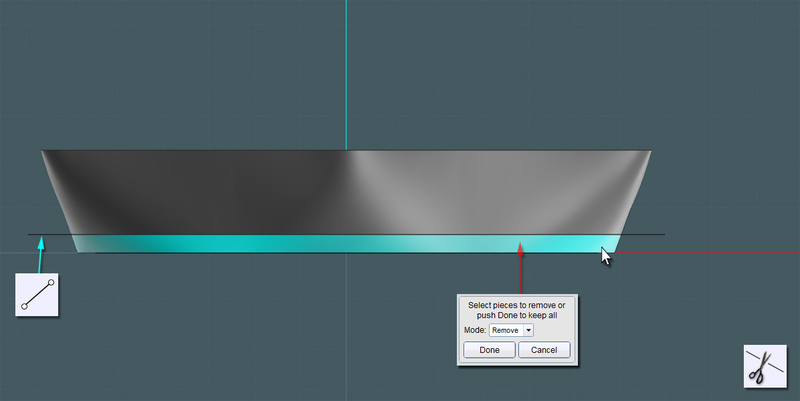 Use Trim to take their projections out of the handle's surfaces. I put the smaller one on top. HEY! 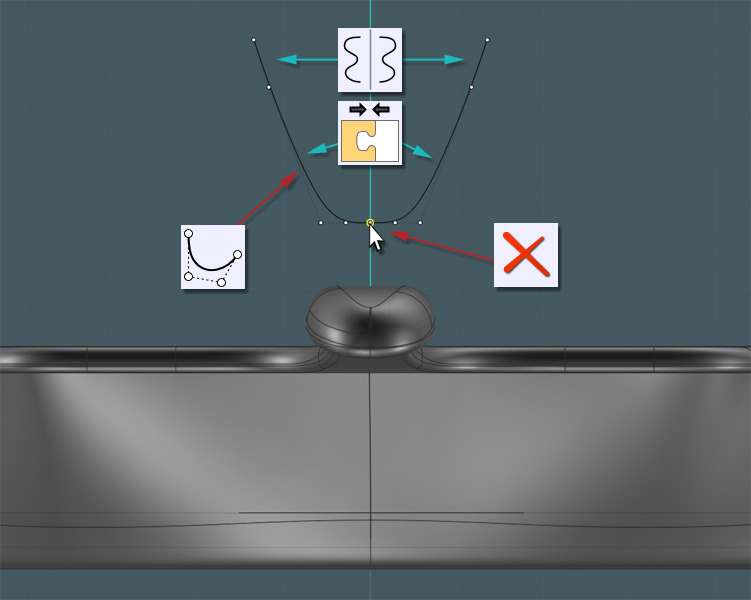 I failed to mention Moi3D's new Blend-to-Everything command! 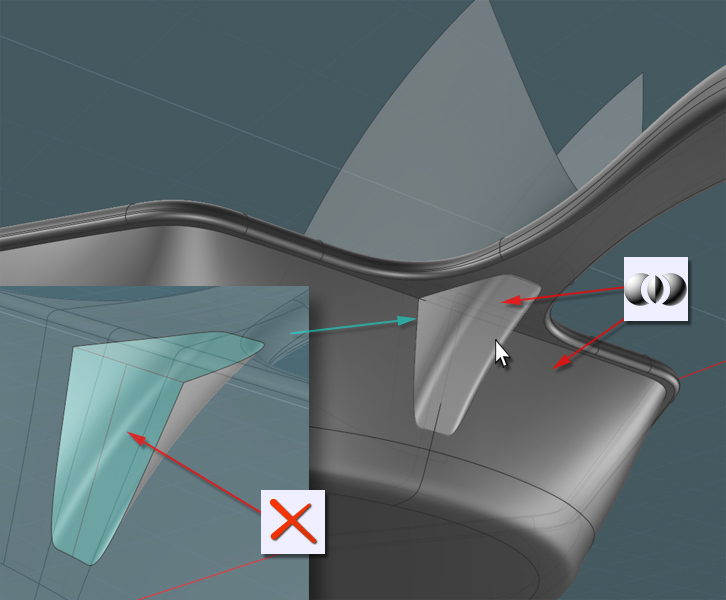 Well, you can Blend on surface edges with seam-intersections included... you can also add adjustment points for fine-tuning in not-so-favorable situations. Create a Blend between both holes - and Join all. 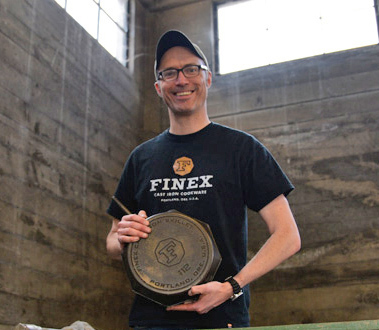 One nice feature of the Finex skillet that caught my eye was the bold engraving on the bottom. 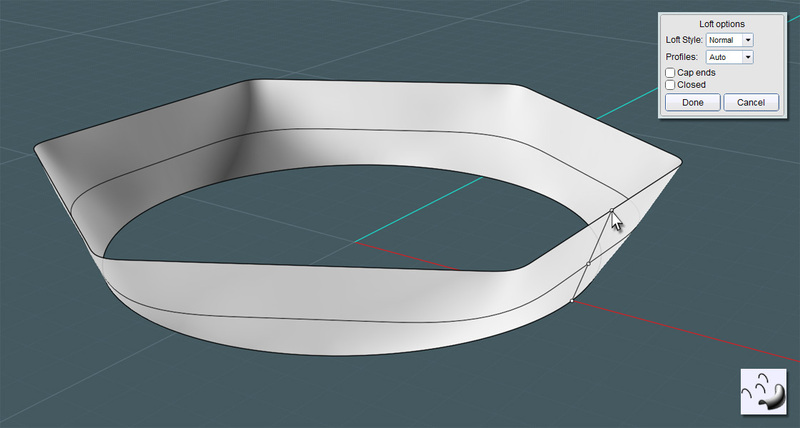 So what I've done here was created a template in my vector graphics program and Imported it into my model. The following is not for novices! 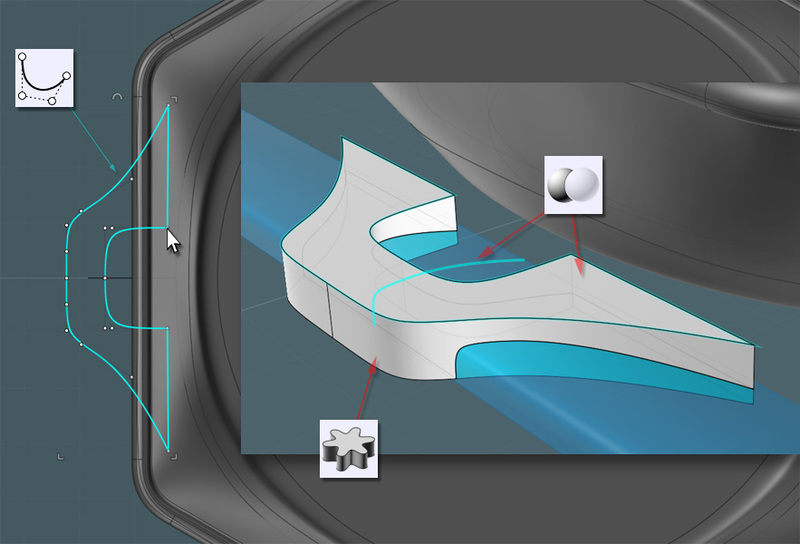 First of all, make sure that your vector import objects are composed of very simple shapes and curves. 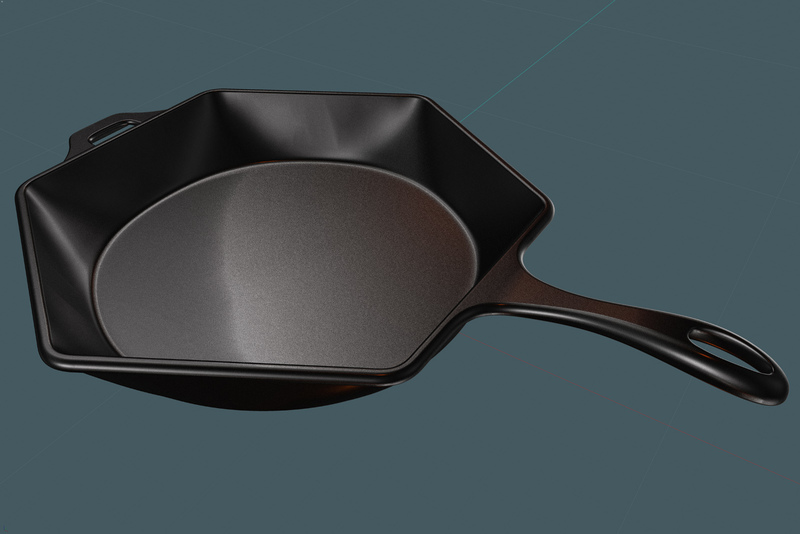 Position then Extrude the template as a solid object into the body of the skillet solid. I used a very simple and small Fillet on the result. Why Fillet something so intricate and tiny? ....Fantastic render results!!! 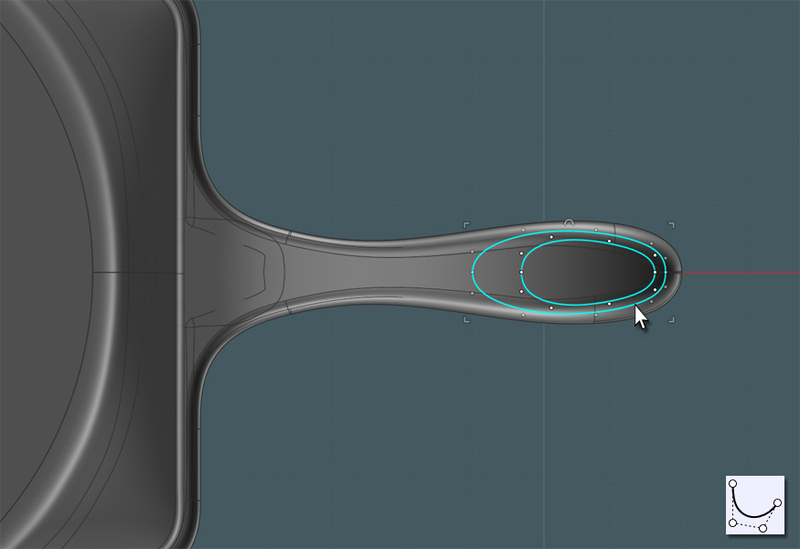 As you might be able to tell, I isolated the bottom circle surface to keep Moi3D from crying. This image was a composite in PhotoShop of different Lighting Options and a little noise added. This is a far cry from the engineering mastery of the Finex guys... I would advice ordering the real-deal. In my opinion, why wouldn't any kitchen savvy person not consider such a nicely executed product? 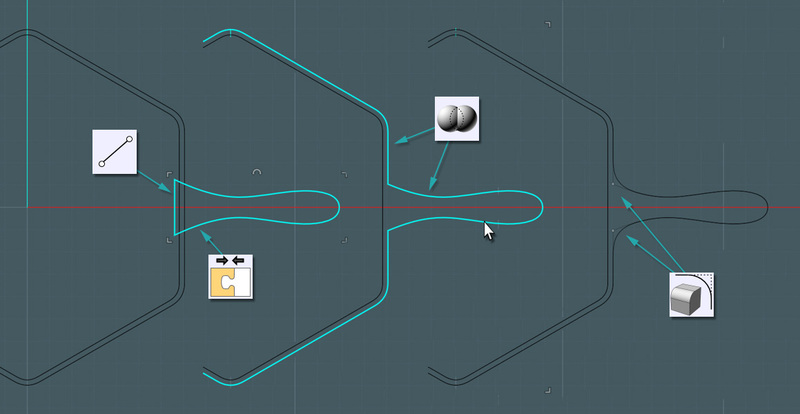 Another great tutorial Mike, thanks for putting this one together! Thanks for another sizzling hot tutorial Mike - I learn something new every time you post a tutorial. After you put this one on the back burner, what's next? I have noticed that the majority of my tuts are kitchen items. >After you put this one on the back burner, what's next? Actually, I'd like to kick one out a month, especially with more for the novice beginners. Good virtual images too,it's hard to render that kind of material..
Good tutorial, but it is a pitty, that it is not in metric measures. Aucune inquiétude... prenez votre temps. Aucune ruée. >Good tutorial, but it is a pitty, that it is not in metric measures. I had to back-track a lot, and I felt that there wasn't the likelihood that anyone following the tutorial would get the same exact result with the same numbers. I may post the metric version of the chart. Amazing as always. Nice to see a new tut from your hand. Thanks. I will just add tommorow some legends under the images for customise a little this superb tutorial! I'll work on the web site links soon. This took about an hour using Taron's Verve fluid-dynamics painting program. 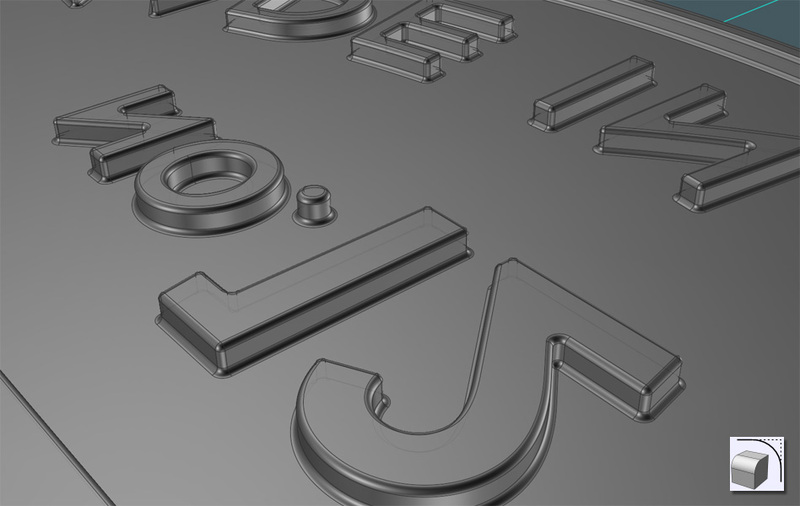 Once Taron allows for input of images to trace from, Verve and Moi will be quite a pair! I only regret not declaring metric measurements as well.